Welcome to another Tasty Tuesday! 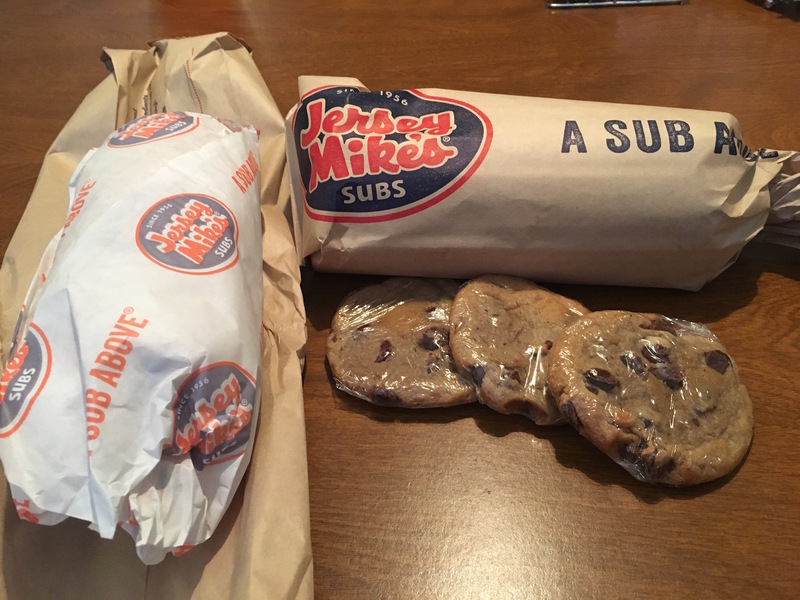 This week’s tasty choice is Jersey Mike’s Subs. Jersey Mike’s Subs is a franchise with almost 13,000 locations. They are also ranked as #6 according to The Daily Meal’s list of the top 25 sandwich joints in the country. I had been to Jersey Mike’s once or twice before this trip, but I had always gotten the same thing. My trusty American classic containing ham, provolone cheese, lettuce, tomato, and mayonnaise. Delicious as it is, I decided to be adventurous this time. Sadly, I was stuck trying to choose between two very different subs that each sounded equally amazing. To solve this tricky dilemma, I took a friend. My fiance, Daniel, and I went halfsies on a California Chicken Cheesesteak and a Club Supreme. We also got three of their homemade chocolate chip cookies because who can resist those babies? We ordered and paid for our food online and were able walk right up to the register and grab it to go. The first thing I ate was my half of the California Chicken Cheesesteak. This is one of their hot subs that was loaded down with delicious, tender pieces of chicken, melted provolone cheese, applewood smoked bacon, lettuce, tomatoes, and mayonnaise. My first bite into this mouthwatering sub of perfection reminded me of your go-to chicken quesadilla at your favorite Mexican restaurant. You know the one. 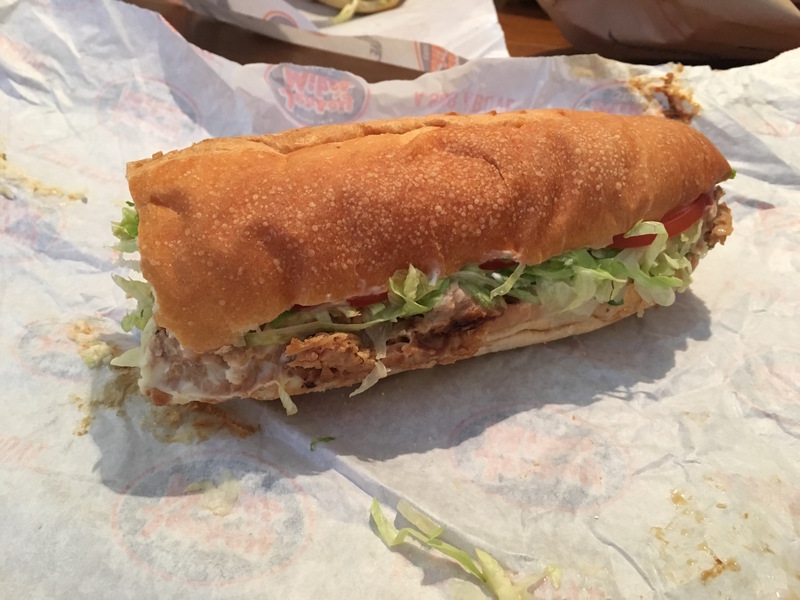 This sub’s perfectly seasoned pieces of chicken were surrounded by the warm, gooey, melted provolone cheese. The subtle crunch of fresh lettuce, tomatoes, and bacon was the perfect addition to this juicy sub. Every little detail, right down to the slightly toasted top layer of the otherwise soft and cushy bread made this sub burst with flavor. As difficult as it was to only eat half of the California Chicken Cheesesteak, I had to keep my part of the deal and switch to the Club Supreme. 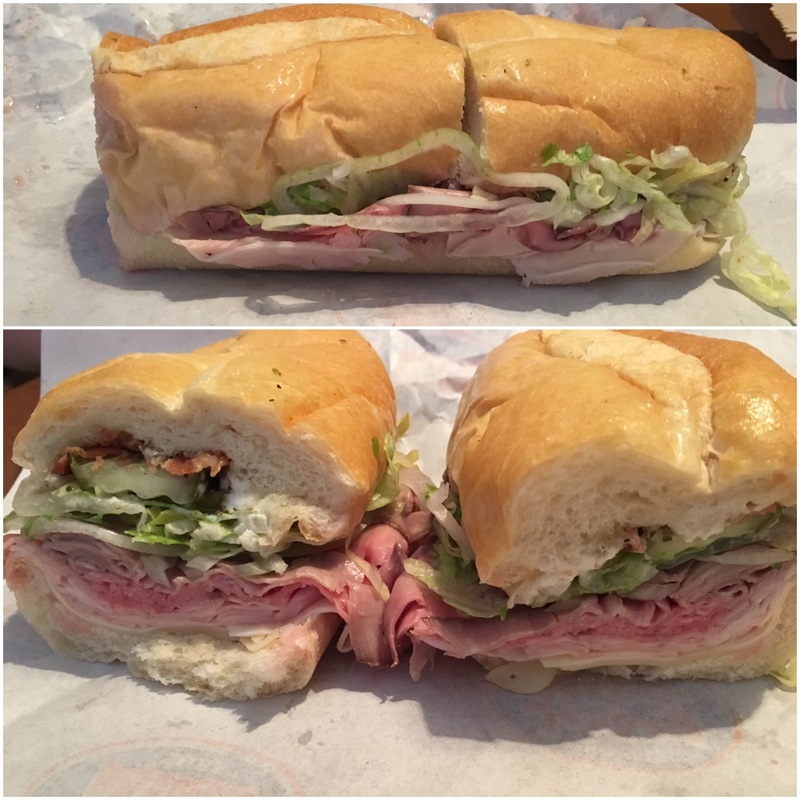 The Club Supreme is one of their cold subs and it comes pre-selected Mike’s way. That means that on top of the roast beef, turkey, swiss cheese, applewood smoked bacon, and mayonnaise comes some onions, lettuce, tomatoes, red wine vinegar, olive oil blend, oregano, and salt. As unadventurous as I am, I was unsure about all of that. Luckily, Daniel was not. And boy was he right. The freshly cut meat combined with fresh vegetables, cheese, and the blend of oil and vinegar was to die for. I don’t usually order food with the oil and vinegar dressing, but this sub has me questioning my stubborn, boring ways. The only bad thing about splitting these two subs is that I still can’t bring myself to choose a favorite. As filling as the subs were, I had also ordered three homemade cookies to finish off my meal. Now I’m pretty skeptical about chain restaurants that claim to have “homemade cookies” because they usually end up disappointing me. Lucky for me, that was not the case with Jersey Mike’s. 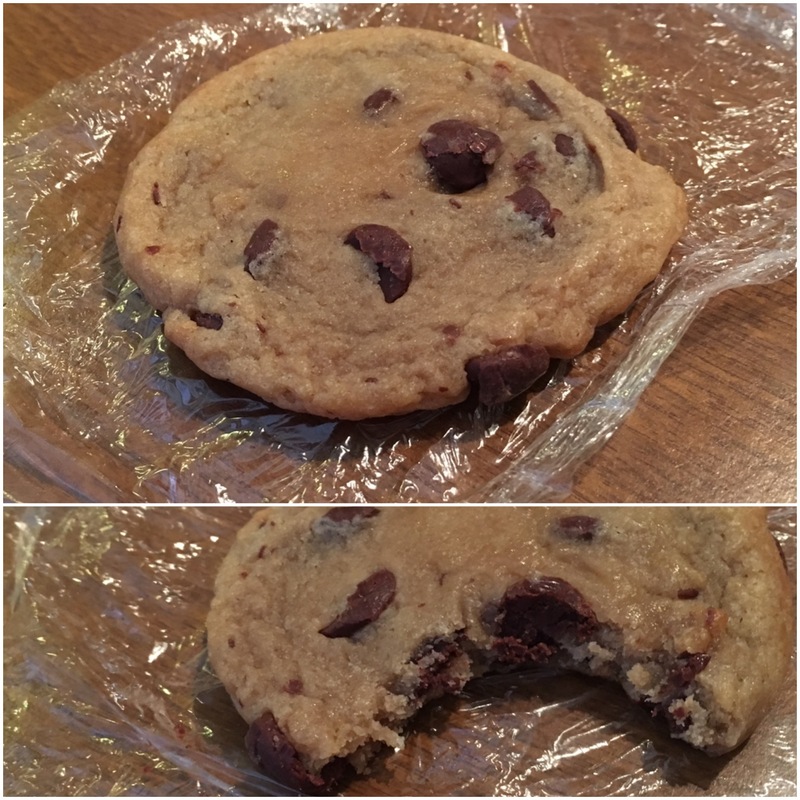 Individually wrapped in clear saran wrap, these chocolate chip cookies really looked homemade. To my delight, when I got the first one unwrapped I could feel how soft it was. From the first bite, I knew they could not describe them any better. These chocolate chip cookies will surely give your grandma a run for her money. 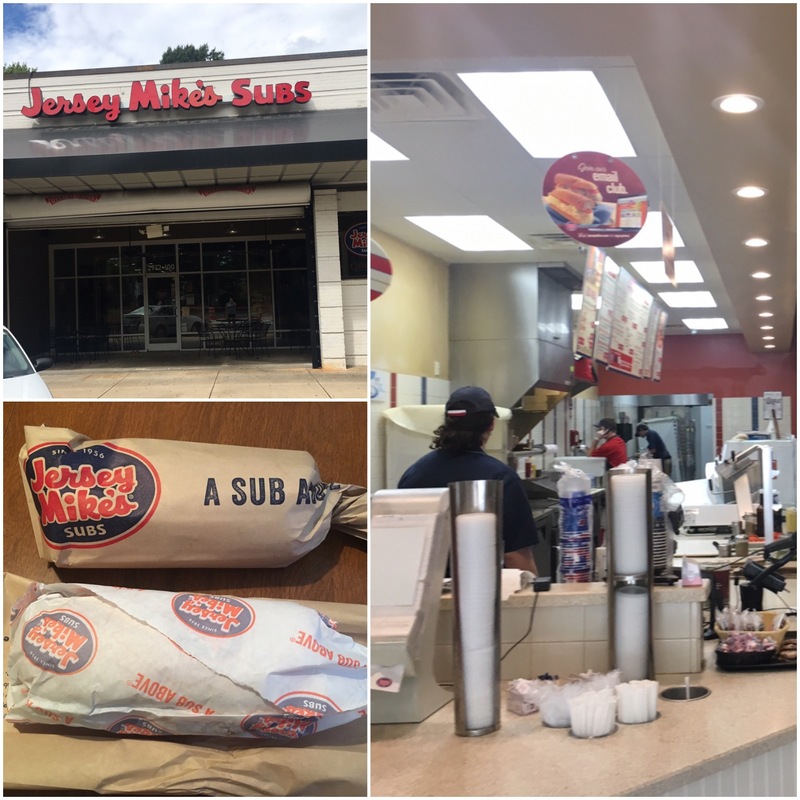 If you enjoy delicious, fairly priced food, Jersey Mike’s is a must visit place for you. It is located centrally across from NC State’s D.H. Hill library, right beside FedEx and Gumby’s. Don’t forget about them when you’re ready for lunch or dinner! Join us next week for our next Tasty Tuesday!